When Mario has had enough of his well-warn overalls, he has been known to throw on a stylish suit. And when it comes to suiting up, before we saw the Mario crew don their cat, penguin, squirrel or bumble bee onesies, the go-to outfit for stylish adventures was the Tanooki suit. Recently reimagined for Super Mario 3D Land, this wonderful one-piece is the start of a new line of resin Super Mario statues by First 4 Figures. 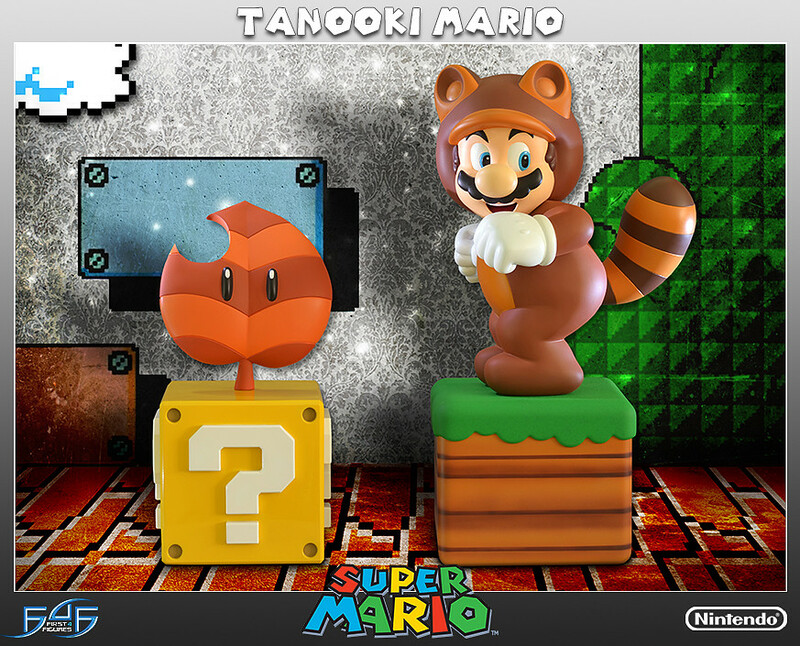 Two versions of Tanooki Mario will be available for preorder; the standard figure featuring Mario suited up and standing on a classy ground base, and the exclusive version which goes one step further and includes a neat little neckerchief (like that worn on the original Tanooki Statue) and a bonus Tanooki Leaf perched upon a question box. First 4 Figures is very excited to reveal Tanooki Mario from the hit-game ‘Super Mario 3D Land’, the first in an entirely new series of Super Mario statues. After collecting a Tanooki Leaf, Mario dons the Tanooki Suit thus granting him new abilities such as a glide and a powerful tail whip attack. We’ve captured him in his trademark pose from the game, shaking his tail and ready unleash the tail whip at any moment. The base that he is stood on is styled after the first world in the game with a rich green lawn atop striped brown soil. 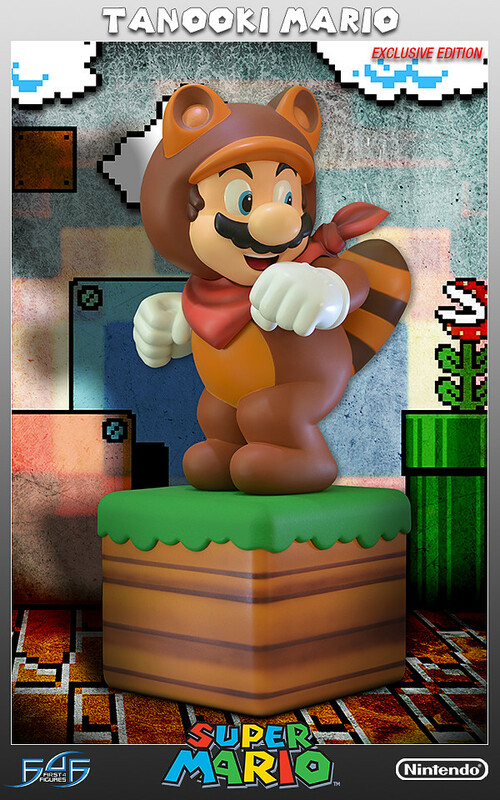 Tanooki Mario is made from high quality polystone resin, complete with hand finished detailing and paint work. He measures 15 inches from the base to the tip of his ears. Comes in deluxe full color packaging, hand numbered base, and includes an authenticity card which allows you to purchase the same number of the model next in the Super Mario series. The standard Tanooki Mario is priced at $199.99 and will be limited to 2000 pieces; as for the Deluxe Edition, there will only be 700 of these available, and and are priced at $239.99. The figures will be shipped in the first quarter of 2014, and payment options are available for the fan that’s strapped for cash (what with all the awesome titles coming out right now). For more information, or to preorder your very own Tanooki-suited plumber, head on over to First 4 Figurines.